A new U.K.-based study suggests that wastewater treatment plants are not being effective at filtering out microplastics. Photo Credit: Minnesota Pollution Control Agency, via Flickr. A July 2018 U.K.-based study followed six river catchments in northern England to gauge the impact of treated sewage effluents as a key source of microplastics. The study’s authors found that microplastics, defined as pieces of plastic 5 mm in diameter or less, were more prevalent downstream of wastewater treatment plants than they were upstream. The implication being that wastewater treatment plants are not effective at filtering out microplastics, the study’s authors suggested. On 24 occasions out of 28, the study team found more microplastics downstream, with one particular sampling finding downstream microplastics 69 times higher than upstream. “It has been postulated that wastewater treatment plants are the main source of microplastics to river catchments as they receive waste from industries manufacturing and using microplastics, for instance as scrubbers in cleaning and cosmetic products, as well as domestic effluent from households using products containing microplastics,” states the study. A 2016 study found that more than 700,000 microscopic fibres could be released into wastewater during each use of a domestic washing machine, with many likely to pass through sewage treatment and into the environment. Many of the microplastics found upstream were believed to have come from sewage sludge applied to agricultural land as fertilizer, the diffuse release of secondary microplastics, and aerial deposition. The study attempted to find a wide variety of wastewater treatment plants that not only served both large and small population centres, but also plants that utilized different treatment methods. The six plants selected use treatments that range from activated sludge, to trickling filter, and secondary biological filter. As there are no standard procedures for measuring microplastics in this context, the study team used mesh sieves to filter out the small particles. “Plastics were identified based on the fact that they were homogenous particles, with no obvious cellular structure, and could easily be dented with tweezers but not broken apart, other than for plastic foam. They were categorized into pellets/beads, fibres, and fragments/flakes,” reported the study’s authors. 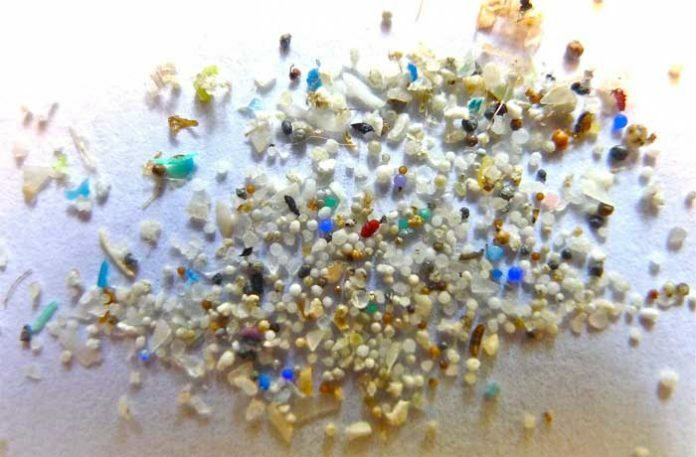 Microplastics recovered during the study were dominated by fibres, fragments, and flakes, as opposed to beads and pellets.